When the statistics are too shocking to believe, when the reality becomes too unsettling, we hear...but do we listen? We hear that 1 in 3 women have experienced physical or sexual violence at some point in their lives. We hear that approximately 800 women die from complications during childbirth every day. And we hear that fewer than 4 percent of CEOs heading the world's 500 major corporations are women. But if we really listened to these women and girls, we would stop seeing them merely as statistics, and instead see them as people, as women and girls full of potential -- full of hopes and dreams. Many of the challenges we face today are daunting. Bill Gates said recently that the idea of saving one person's life is profound and thrilling, but when you talk about saving millions of lives, it can sound almost meaningless. Has our decades-long push for gender equality become meaningless? Progress has been made. This is undeniable. But progress has been far too slow and uneven. This is simply unacceptable. It is unacceptable that today, 62 million girls around the world are not in school. It is unacceptable that more than 250 million of our 15-year-olds are already married. It is unacceptable that at current rates of change, it may take more than 70 years for women to achieve equal pay for equal work. And it's unacceptable that worldwide, only 1 in 5 parliamentary seats are held by women. The list goes on and on. Women and girls deserve better. They deserve a better future. International organizations in Geneva work hard for this future, demanding equal rights and improving opportunities and conditions for women and girls -- from the programs at the WHO focused on gender-based violence to the efforts of the ILO to ensure safe work environments for women to the ITC's efforts to help women entrepreneurs succeed. And it's not just international organizations. NGOs such as World Vision, CARE and Save the Children are working in Geneva to shine a spotlight on the most pressing needs and to deploy resources where they will have the greatest impact. It's clear that this "better future" has many definitions, many approaches, many paths, and that these issues are more complex and global than ever. To accelerate progress, we need to unite around innovative, comprehensive solutions. And "International Geneva," with its unique collection of diplomats, policy makers, specialists, business leaders, research institutes and civil society, presents a platform like no other. Over the past few months, the U.S. Mission in Geneva has been driving collaboration and creative problem-solving through its Future She Deserves initiative, focusing primarily on gender-based violence, adolescent girls' health, economic empowerment and leadership opportunities -- all critical areas for protecting and empowering women and girls. And the results have been encouraging right from the start. International Geneva has embraced this concept, imagining new ways of working together and re-committing to prioritizing gender issues throughout their organizations. 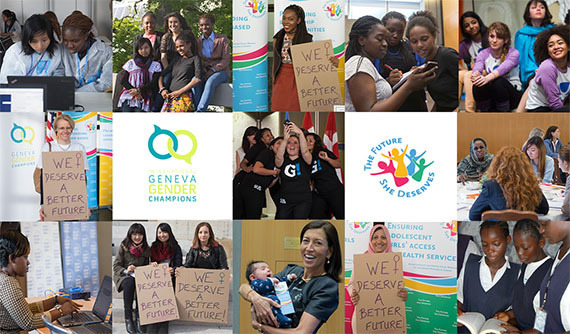 As part of this collaborative effort, the United Nations Office at Geneva (UNOG), U.S. Mission Geneva and Women@TheTable recently launched a new leadership network called Geneva Gender Champions. Already, more than 65 Ambassadors and heads of International Organizations have signed on as Geneva Gender Champions, making specific commitments on behalf of their organizations to advance gender equality. We will continue to expand this network over the coming months, including through the addition of leaders from the NGO community and the private sector. Because everyone has a stake in the future of women and girls, and only by working together will we bring about lasting change. So the next time you hear a statistic highlighting ongoing gender inequality, remember that here in Geneva we are listening, and that we are working hard to help every woman and girl realize the Future She Deserves.